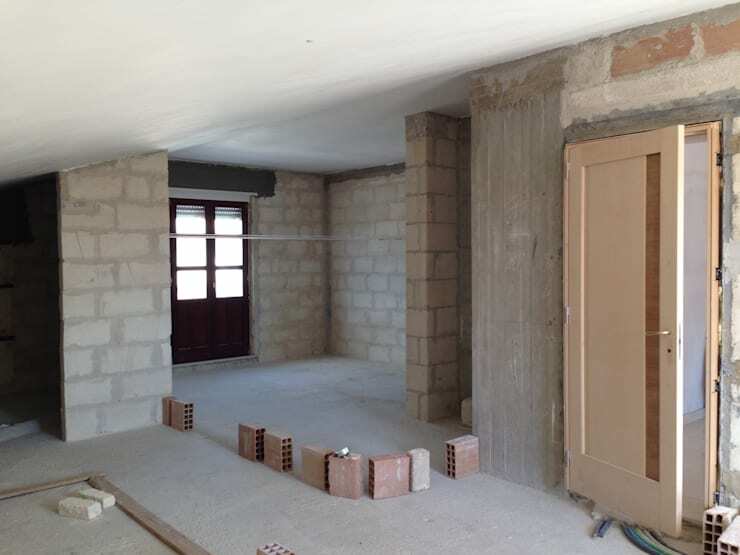 After construction, the interior of the house was lying incomplete, bare and dull. The right kind of paint, furnishing, and decor accents were required to turn this shell into a cosy abode. Organisation hacks for efficient utilisation of space were also necessary. 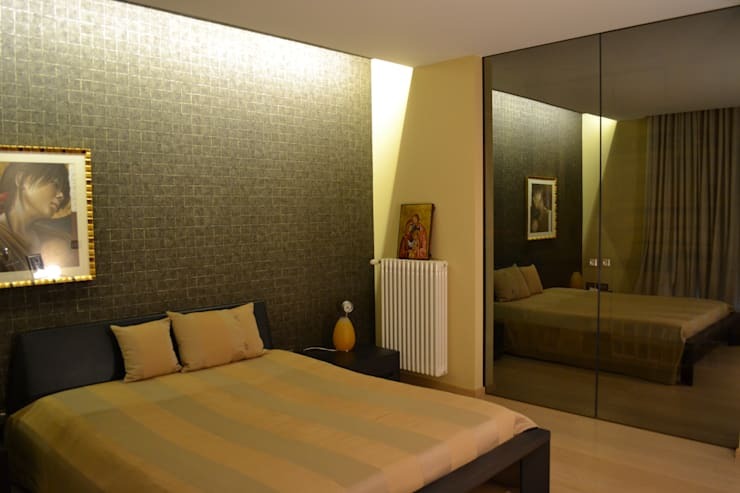 The entrance to the apartment is a large glass sliding door flanked by enticingly painted walls. A tall smooth white planter can be viewed from here, which complements the plush white sofa inside. 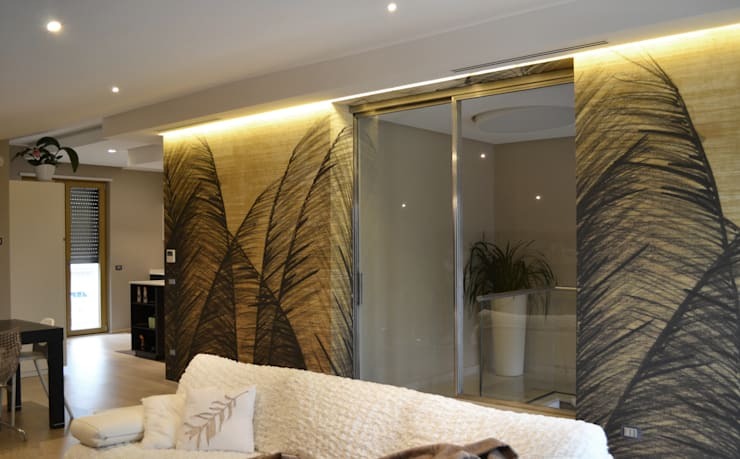 Clever concealed lighting casts a magical glow over the artsy walls on each side of the door. The ambiance is relaxing and calm. The amalgamation of light and dark wood has transformed this living area into a warm, inviting space where functionality is as important as comfort. 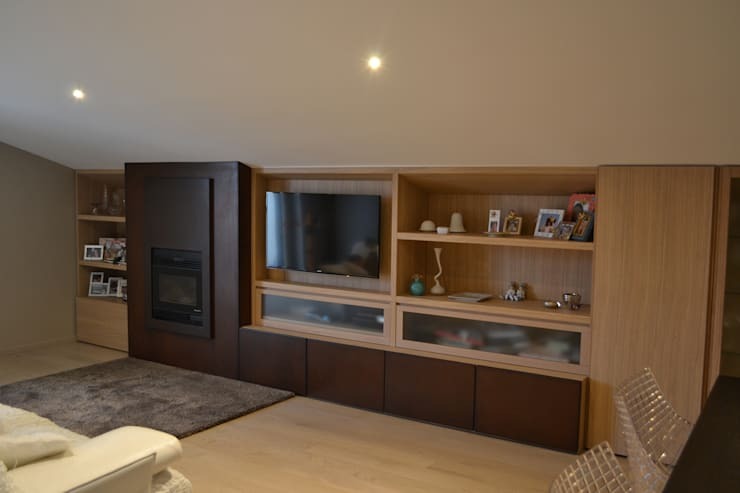 The expansive wall unit features ample open shelves, closed cabinets, and a zone reserved for the modern fireplace. So, all storage needs have been taken care of. A plush greyish rug creates a harmonious bond between the couch and the wall unit, and contrasts the light-hued floor nicely. The dining area lies on the right, and stands out owing to its wire mesh chairs which are simply unique. The space around the dining table has been put to excellent use with tall in-built shelves which slide into the wall seamlessly when not in use, and pop out when you have to store stuff. A tower of shelves in the corner can also be used to display artefacts, photographs and such. 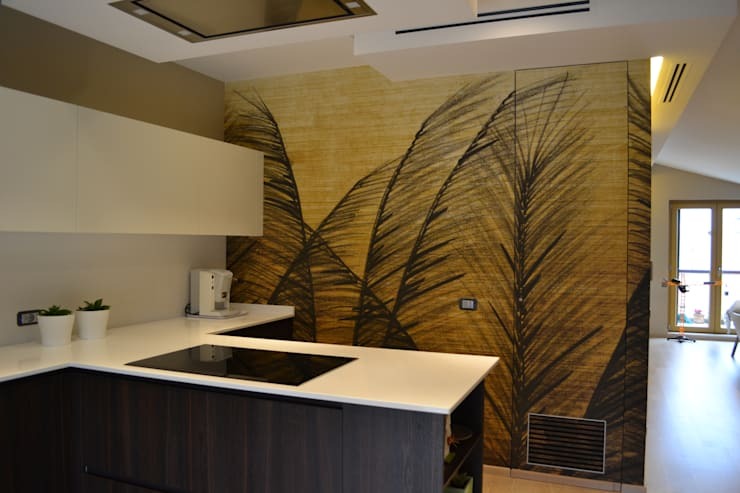 The painting of the beautiful palm fronds which adorns the entrance of the residence has been embraced in the kitchen too. It lends a lively background to the sleek and smooth white counters and dark wooden cabinets. An embedded cook top and a few miniature planters make the kitchen a clutter-free space where cooking is fun! The bedroom is a spacious and cosy haven where the olive green textured feature wall behind the headboard steals the show. A beautiful artwork complements the wall amazingly well, while a satiny striped bedspread promises sheer comfort. 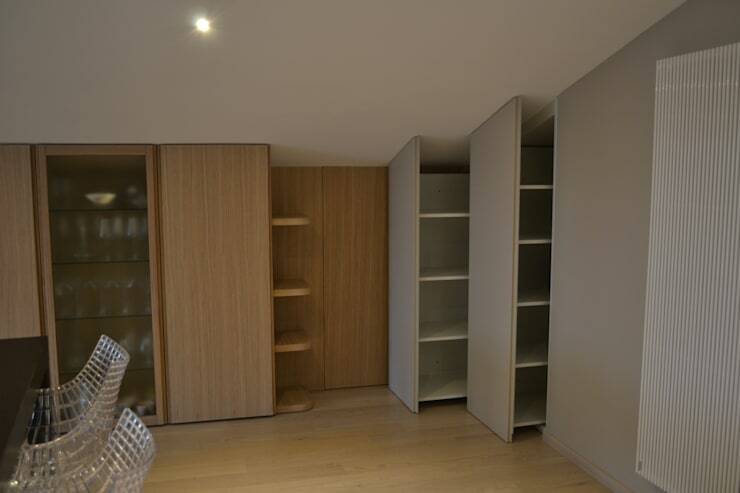 The massive in-built closet beyond the bed features mirrored doors, and hence acts as a multifunctional furniture piece. Concealed lighting and flowing drapes add an enchanting touch to this bedroom. 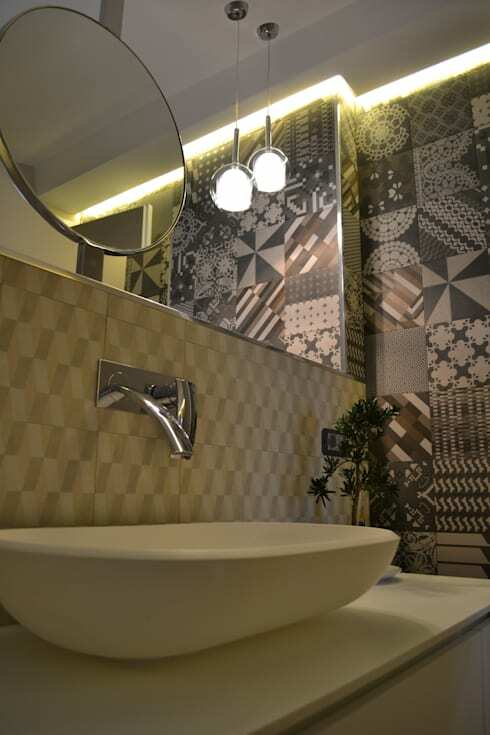 Grey and white come together on the walls of this elegant bathroom to create patterns which delight the senses effortlessly. A modish contemporary basin sits facing a geometrically-inspired tiled wall, over which hangs a circular mirror and a pair of brilliant pendant lamps. Definitely a fashion statement! The once barren Italian home is now an extremely stylish and highly utilitarian space where comfort and understated luxury go hand in hand. For another heartwarming transformation story, take a look at: From shabby to chic: a drab apartment finds its style. What do you think of the unusual decoration in this apartment? Would you consider something similar in your home? Let us know!